Situated at No. 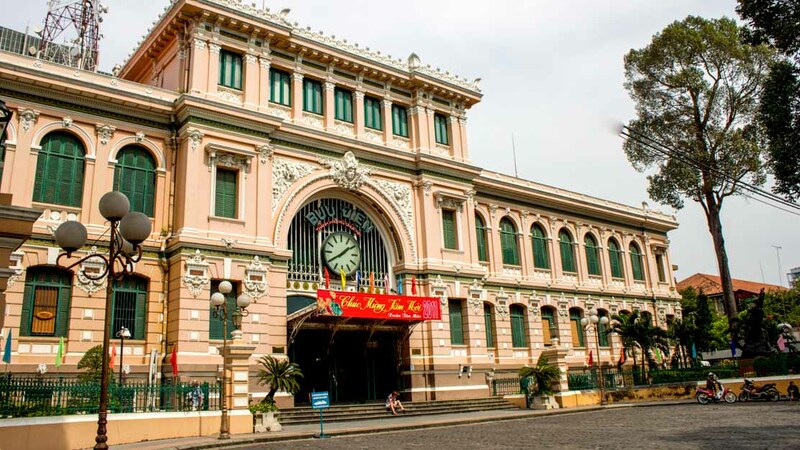 2, the Paris Commune Street, District 1, Saigon Central Post Office is one of the most typical architectural works in Ho Chi Minh City. Being a mixture of Gothic, Renaissance and French influences, the building fascinates tourists by its typical colonial French features, from exterior to interior decorations. It was built around 1886 – 1891, based on the design of Gustave Eiffel – a famous French architect along with Foulhoux, his assistant. Tourists come here partly to admire the unique architecture of the post office, partly to immerse themselves in the ancient world, from the post office boxes to phone booths. They also can comfortably stay on the varnish-polished benches which exist hundreds of ages. Today telecommunication systems have become much more familiar with the citizens. Yet in the period of first half of the 20th century onwards, the postal system is still unknown to numerous Saigon people. 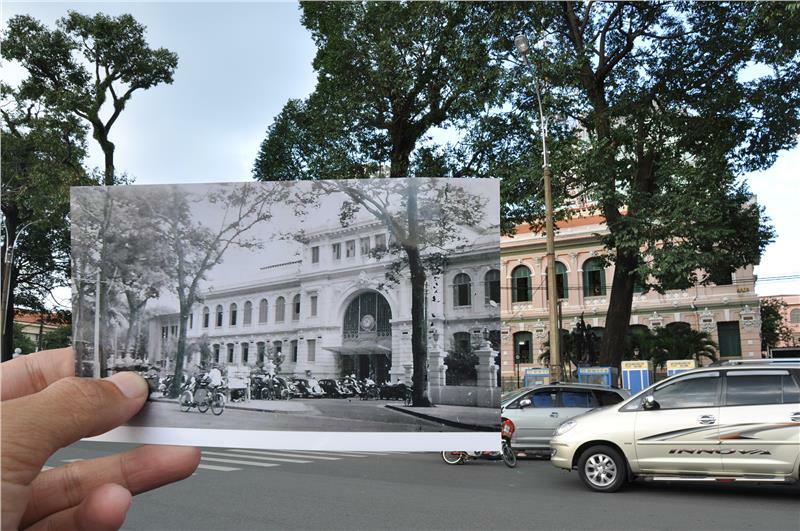 That is the reason why right from its inception, the building strongly attracted and impressed on Saigon citizens at that time. Saigon Central Post Office today is one of the most well known architectural works in the city. 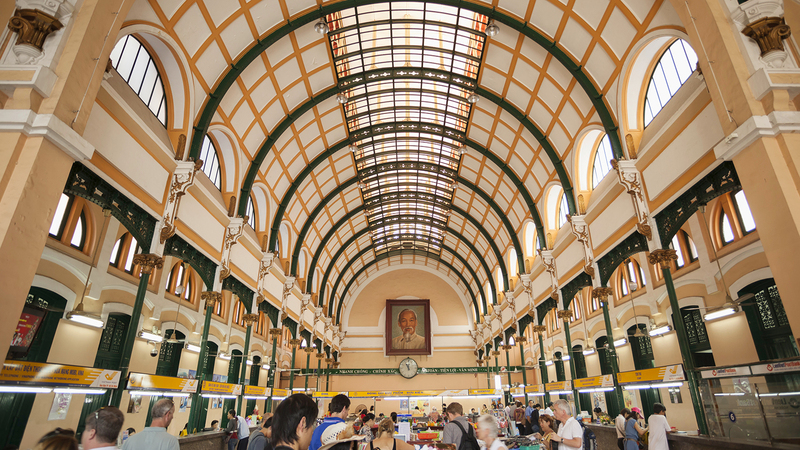 It gradually becomes an indispensable tourist attraction in Ho Chi Minh City. Unique beauty of the City's Post Office building has increasingly lured the large number of tourists thanks to a magnificent architectural works, Saigon Notre-Dame Basilica with 2 soaring bell towers. The building has always been the post office center of the city since then. The building features a balanced architecture of the high-aesthetic work items. All of the details and symmetrical balance are divided into both sides through a center "axis". The facade retaining cubic structure with the arches above the entrances has recorded the names and faces of of the characters, representatives of French celebrities. Among these names is the President of the United States Benjamin Franklin, the Italian inventor Alessandro Volta, the British physicist Michael Faraday, French mathematician André-Marie Ampère, Gay Lussac, Oerstedt, Ohm, Arago, Galvani, Foucault, and Laplace. Together with the names and the faces, there are also some inscriptions, which he would like to dedicate these illustrious characters related to discoveries and advances in the field of electricity. There are also 2 maps talking about the history of establishing Saigon telecommunication system on either side of the interior walls. They respectively are “Saigon et ses environs 1892”, which translates to ‘Telegraphic lines of Southern Vietnam and Cambodia 1892” and “Lignes télegraphiques du Sud Vietnam et du Cambodge 1936” translating to ‘Sai Gon and its environment 1892′. The system of main and sub-pillars, and eaves are textured in square. On top of each pillar are elaborately and meticulously carved patterns and bas reliefs. The system of contour is the string of horizontal motifs in the frontispiece of the building creating beauty and harmonious balance. On the arc of the building is a large clock as the witnesses for the existence of whole building. Inside the building is a system of the dome adjacent main entrance and a long arch inside. The big dome is supported by 4 iron pillars located at 4 corners. All of the convergence points between the pillars and rafters are elaborately designed, and carved into beautiful architectural details. Thanks to the system, whole building becomes much higher, more spacious and airy. With such a unique design from exterior to interior decoration, Saigon Central Post Office building can be seen as a building with a unique and colorful architecture at that time in Saigon. 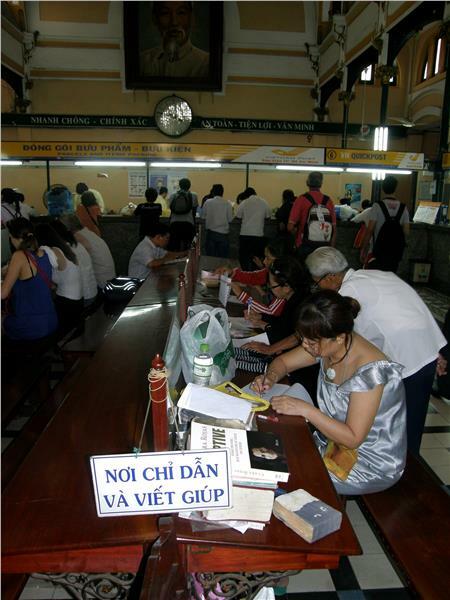 Located in the city center, the great beauty of Saigon Central Post Office has increasingly attracted tourists. Surrounded by Saigon Notre-Dame Cathedral with 2 soaring bell towers and spectacular architecture, along with the 2 modern skyscrapers, the building retains a harmonious combination of ancient beauty and the breath of modern life. It is worthy one of the architectural works attracting the most number of tourists in Ho Chi Minh City tourism.